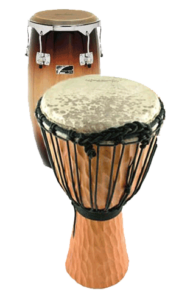 The instruments we use include: marimbas, hosho (gourd shakers), mbira, drums, whistles, kudu horn, the audience and vocals. 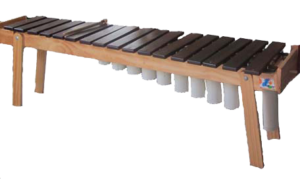 The MARIMBAS, are hand-crafted – the keys are made of PADOUK, WENGE AND MAHOGANY all very hard woods that produce beautiful tones. Below each key is a resonating tube which amplifies the music. Each resonator has a buzzer, a vibrating membrane attached to it. 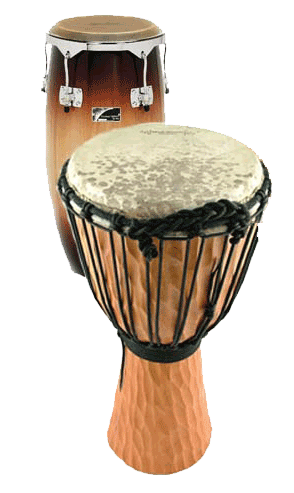 This buzz is thought by some to keep evil spirits away, and adds a unique quality to the music. Kuungana’s rhythms and energy are incredibly captivating! We enjoy their music so much that we invited them to play for our wedding reception. Dozens of people from the reception commented on how fantastic the live music was for dancing and celebrating! Kuungana’s music is truly memorable! The MBIRA is an ancient instrument with a long history of use in traditional ceremonies. 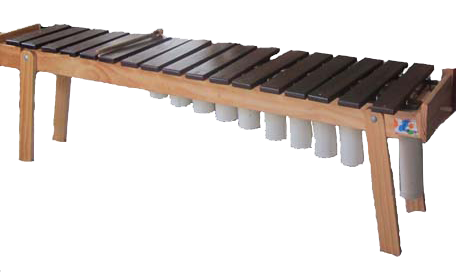 Staggered metal keys are attached to a wooden sound board. 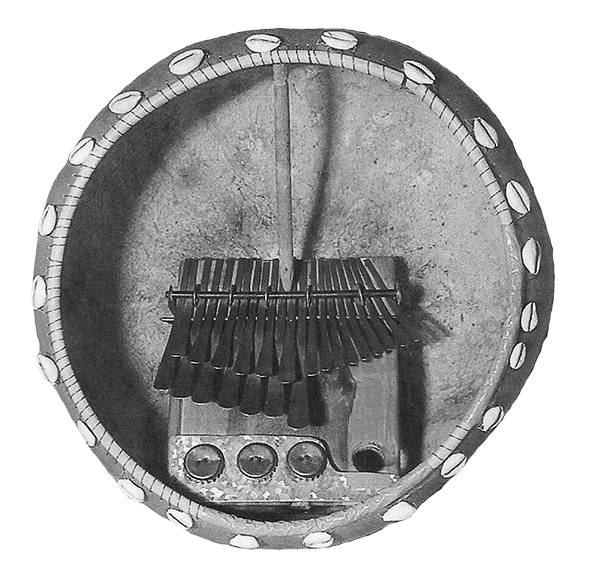 Often, the mbira is played inside a deze, a big gourd which provides amplification. Bottle caps are often attached to the instruments to create a buzzing sound. 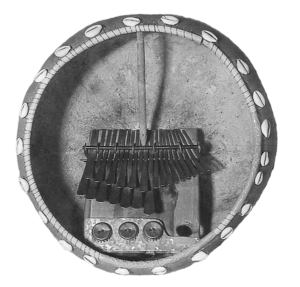 There are a number of mbira types. The one that we most commonly play is the mbira dzavadzimu which has 29 keys – arranged in two rows for the left hand and one row for the right hand. 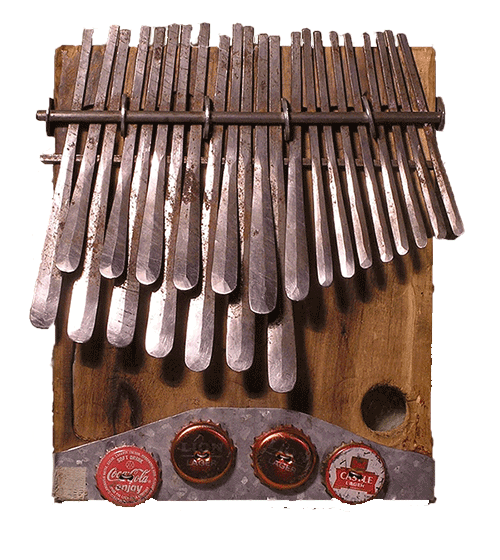 A second type of mbira that we play is the nyunga nyunga – which consists of 15 metal keys arranged in two rows. 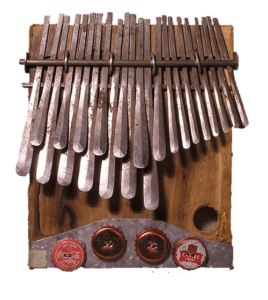 Here is a mbira in a DEZE. Note the stick used to hold the deze in place. HOSHO are traditional Zimbabwean rattles consisting of a pair of gourds with hota (an African lily) seeds. These instruments help keep the beat. We incorporate more varied rhythms into our music as well. CLAVE, WHISTLES, WOOD BLOCKS, a KUDU HORN, and DRUMS all can supplement or replace the hosho.